Over the past year and a half, I’ve been part of the team developing Gauge — an open source, acceptance test automation tool. Working on a product made me think about "What’s essential to build a good product?" When we think of empathising with our users, we end up wanting to build things to empower them. In this post, I’ll talk about how we made crucial software architecture decisions based on what would empower our users. We knew that Gauge has to be lightweight and highly customisable. Plug-in architectures are an attractive solution for teams seeking to build applications that are modular, customizable, and easily extensible. Yes, Plugin architecture helps a product be extensible, but.. Engaging with the user community and recognising the right direction for an extensible design is crucial. So, we engage with our user community to understand how to empower them better! As expected, distribution of responsibility in executing tests of a suite has been the most important architectural decision of Gauge. To do this, we identified the key components of the product and their responsibilities. Broadcasts messages that the plugins use to perform custom actions. Respond to the request Gauge sends (validate, execute…). Can I use user empathy to validate Architecture? Sure, we had a nice design in place. And, we wanted to provide a way to help change the mindset of any team using Gauge from "Can I.." to "How can I.."? The answer to most of these questions to the one posing it is "by writing a plugin" but for this post, I’ll highlight how the architecture sets out to answer these questions. How can I create or choose my preferred reporting format? We know that Gauge core is orchestrating and broadcasting messages. We built reporting as an independent plugin. So this way, it performs the required reporting-related actions by listening to these messages. So, the report format is independent of how the tests are executed (parallel, sequential). And any customisation is reusable for tests run in any supported language. The reporting plugins we built usually listen to the event SuiteExecutionResult, that is broadcast almost at the end. So you can have the default reports generated in HTML-reports, XML-reports or write a custom reporting plugin. Here is how you can get a quick start to author a custom reporting plugin — Report-seed. This is in Java, a similar approach can be followed to write custom reporting plugins in other languages also. How can I run tests in the language of my choice? We designed Gauge core to broadcast Protobuf messages to the plugins mentioned in a project’s manifest file. Protobuf is a language and platform neutral mechanism for structuring data. All this, with Gauge-core authored in Golang! Read this if you’re interested in authoring a new language runner for Gauge. How can I use it with an IDE of my choice? 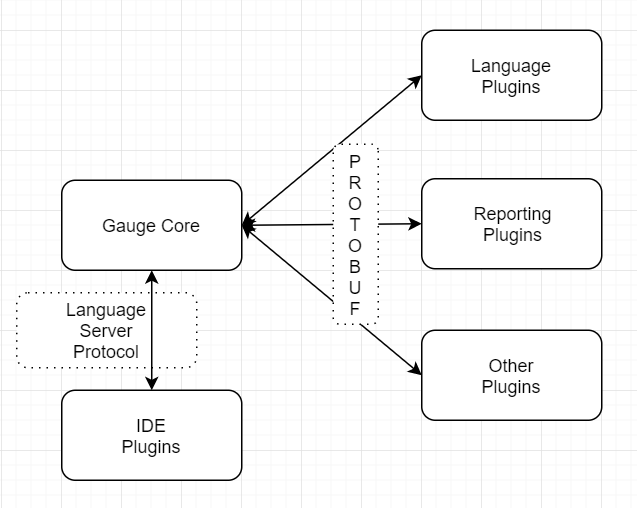 We designed Gauge to have a language server protocol (LSP) implementation. This helps different IDEs LSP clients take advantage of it. So, we have gauge-vscode which is a plugin to Visual Studio Code. This article will not only help you understand the offered Gauge IDE features but also gives pointers on adding a new IDE support for Gauge. Should I write a custom plugin for something like parallel execution? Consider a product design that requires the users to write a plugin to run tests in parallel. This means, the tool (the execution and reporting) handles only sequential execution by default. What if the user has to write a plugin to add parallel run support? On CI, parallel and sequential options have to be explicitly handled on separate tasks of execution and reporting. Would this be as effective as it should have been in empowering its users? We think not. In Gauge, such features are built in core. All related tasks are handled by default. So, such architectural decision makes a feature (e.g:parallel run) readily and easily available to any user running tests in any language of choice! What I’ve tried to say is that empathy is not just the prerogative of the Business Analysts, User Researchers, UI folks or the front-end. Having users at the heart of everything also means putting their interests forward while making architectural decisions. Empathy needs to seep into our very core! (forgive the pun) and that’s what is essential to build a good product.